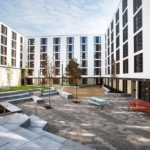 AVAILABLE FROM 12-27TH AUGUST Salisbury Court is a newly built (2016) and highly quality purpose built student development made available for festival paerformers. 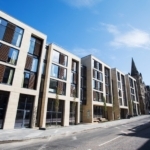 Located in a fantastic festival Southside area , it is near festival locations such as Pleasance, C Venues and Zoo Venues. 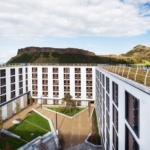 Close to Royal Commonwealth Pool and views of Arthur’s seat in the adjacent Holyrood Park. We are offering several exclusive 10 bedroom apartments, which are perfect for groups (10-20 people). Each apartment has 10 x ensuite bedrooms, each with a small double bed (4ft width), private desk and en-suite shower facilties. You’ll also find plenty of storage space under your bed in addition to a wardrobe, drawers and shelves. Bedding and towels are provided and changed on a weekly basis. 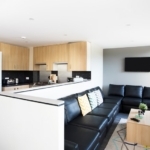 Each apartment has a communal kitchen off the bedroom hallway, which is fully equipped with fridge/freezers, oven and hob, microwave, kettle, toaster, crockery and utensils, flat screen TV (freeview) and breakfast bar /eating area. There is a small seating area with coffee table too. WiFi is complimentary with bike storage and laundry facilities available on site.